Calm down… It’s not what you think. There’s nothing gossipy you will be able to find in this article. Sorry to disappoint, but we thought we’d be a good friend and tell you of some third party payment methods you can begin a relationship with. Wait a minute, but couldn’t you just access worldwide online shops with just your credit card at hand? That was the whole point of the Visa campaigns that tell you the world is at your feet, isn’t it? Well, it turns out that there are still some sites and companies that still may not accept foreign credit cards, which will amount to quite some disappointment when you’re on a shopping spree on a new cool label or site you’ve just discovered. So we’ve been searching for some ways you can work around it and do all the shopping to your heart’s content. Another reason besides being able to make payments, signing up with a trusted third party payment processor could mean safer security. Trust us, in this day and edge of living with online hackers, limiting the number of times you key in your credit card number in your computer or giving it out liberally to various online merchants would greatly reduce the risk of credit card theft. 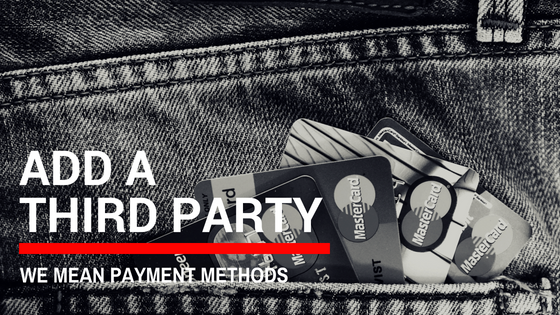 Here are some examples of online third party payment processors, some of them you may be slightly familiar with. If you aren’t (and we assume you aren’t) new to the world of online shopping, we are pretty sure you would know what Paypal is. If you don’t… REALLY?! Paypal, at this moment, is the most globalized digital payment platform. And apart online merchants making use of their business solutions as their main core service, it’s an excellent way for startups who are taking their business globally in terms of requesting money and invoicing. As a personal account user, you’d be glad to know that the biggest selling point of using them would be their 24/7 fraud detection monitoring, so you can be sure that your payments are secure. And once enter your credit card details, you save time with faster checkouts! That’s highly useful when you’re trying to beat someone to the punch when ordering limited edition items. Amazon pay, unlike it’s namesake, is not a service that is solely limited to the pages of Amazon’s merchants. Now, they have opened up the use of their payment service for goods or services on third-party websites. Some names that you might recognize that accept Amazon Pay would be Moda Operandi, Nine West, and even Dyson. And if you already have an Amazon account and have saved your financial details in your account page, you already have access to the Amazon Pay service, no additional steps required. Although at the moment it seems that the service is mainly targeted at US stores, Amazon.com has made it quite clear that that are rapidly expanding the digital payment service to include shops in the Amazon Global family. If that is so, it completely makes our lives a lot easier when accessing our favourite products in the UK or even Japan! You cannot talk about third party digital payment solutions without talking about the one created by Chinese giant Alibaba. The rate China adopts new technology in the fields of finance and business completely leaves the rest of the world biting the dust. Alipay is positioning themselves as the leader in online and mobile payments with half a billion users (and counting), and they are not just limiting themselves to China. Jack Ma saw an opportunity in allowing global payments because of the increasing demand in Chinese products, so now instead of doing the whole back and forth with individual merchants on getting your CC accepted, you can just go through Alipay. Apart from the usual world class security offered, we were really impressed that they offer 100% reimbursement for unauthorized transactions, and a 90-days payment protection! One other piece of evidence that China is WAY ahead of the rest of us in terms of adopting mobile payment is the firm presence and impact that WeChat Pay is making in their home country. The one reason our money (pun intended) is going to be on WeChat Pay gaining the larger share of the market pie is because the service is based on the actual mobile chat application itself, which already has an enormous user base. As widely used WeChat Pay is in China itself, it has yet to make its presence known in the international markets, but we are optimistic that they will be making their way to our shores soon, especially since their main target market are Chinese nationals residing or traveling out of the country. Already, those in Malaysia are able to add an non-Chinese bank account as a payment method on WeChat Pay. The only catch? You need to have downloaded the app in Hong Kong or China. There are few viable options for digital payment solutions if you are a fan of Korean products and want to get your hands on your favourite brands not available in Malaysia. Which does make us a little sad. But allow us some speculation as to what’s to come in the future. If you’ve been paying attention, you’d have noticed the strong reemphasis in our Finance Minister’s LGE Malaysia’s move adapting new internet technologies at lightning speed. We still have a long way to catch up as our neighbours, Singapore, have already been investing to into South Korean startups, like Toss. In Korea, Toss happens to be one of the main competitors against Kakaopay (the WeChat Pay equivalent in Korea). Could there be the spillover of Toss developing a cashless payment solution in Malaysia that will break digital barriers? I guess we’re staying tuned! Of course, we recognize our limited research can only cover this handful of the more prominent players, we haven’t even gone looking into shopify and their expanding list of global shops. And we are also really looking forward to more emerging tech companies who are at this very moment brainstorming for ways they can make online transactions more seamless not just from your computer at home, but over your mobile! Also, humour us! Like this post if all this talk of third parties are getting you a little bothered, and comment if you’d like us to give you more.